For the past few sols Curiosity has been exploring a diverse assemblage of cobbles and boulders on Vera Rubin Ridge, trying to understand how this blocky deposit came to be, and what the variety of rock types can tell us about geologic processes in Gale crater. We've been really excited by the diversity of rock types, as seen in the above Mastcam image. The team decided to stay for one more full day of contact science before driving away in tomorrow's plan. I was the SOWG Chair today, and we tried to pack as much science as possible into the plan, pushing the bounds of our power and data volume limits. We were able to plan 3 more contact science targets, and we'll acquire a full suite of MAHLI images and APXS data on each of them. The targets include a smooth gray rock named "Minginish," a well-cemented, finely-laminated rock named "Sanquhar," and a well-stratified rock named "Rousay." The Geology theme group also planned several ChemCam observations to assess the composition of different rock types, and three Mastcam mosaics to document a nearby light-toned outcrop, a view toward the sulfate-bearing unit, and the Greenheugh pediment in the distance. The Environmental theme group planned standard DAN and REMS observations, and a Navcam dust devil movie to find and characterize dust devils. 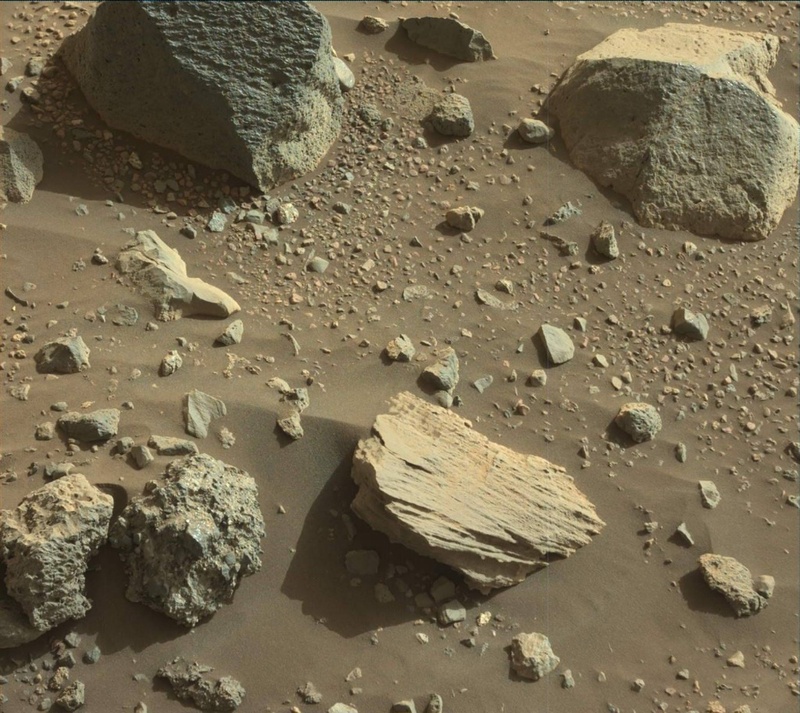 It's been a lot of fun to see the diversity of rock types that Gale crater contains!